Thank you for helping me shine my light! I have really, really big news, friends. The We Need Diverse Books organization chose me as a recipient of one of their five Walter Dean Myers Grants! The grant will allow me to take two illustration courses, help me pitch my work to publishers, and work on my kids books. I’m so excited for 2019! Thank you, WNDB! And if you’ve never heard of Walter Dean Myers, check him out. He was a writer and a champion of literacy and African American representation in YA and children’s literature. I am deeply honored to have been considered for the award, and even more so to have been chosen. I hope to do right by it. It’s nearly Thanksgiving! Here’s one of my fave recipes that combines two of life’s most delicious things… pumpkins and cheese. The Getting to Know Your Picture Book workshop and retreat led by Debbie Ridpath Ohi featuring Heidi Stemple was awesome. We spent weeks dissecting our manuscripts on an online forum, and then a month or two later, we met in real life and had 1:1 edition sessions and group round tables to discuss our stories. We were able to edit 2 of our manuscripts during this time, and the course was jam-packed with information and a wealth of knowledge. So, the course itself was very much worth it. The interactions with other attendees and mentors was priceless. How’s it work? Well, the first portion of the class was online (using a platform called Schoology). We had lessons online, reading, and exercises to follow. We commented on each other’s work and followed through with turning in manuscripts and portions of our stories. Then we went back to the drawing/writing board and worked on edits and sent in our manuscripts a week or two before the in-person retreat. The grounds of the Highlights Foundation are at the foothills of the Poconos in rural Pennsylvania. It was gorgeous. I had lived in the Catskills for a summer, and it was very similar. We had a foggy morning or two and it was gorgeous, mysterious, dazzling. It drizzled and there were so many songbirds, butterflies, walking paths. Because it was in September, there were a few hot days and a few cool days. I added an ‘unworkshop’ or extra day to my stay. I’d definitely check the weather before going, but be prepared for rain. Our mornings began with a nourishing breakfast, informative lectures, a session or tour. Then we’d lunch, have more sessions, and we’d break for the evening. We heard from the seasoned editor-turned-agent, Rubin Pfeffer and he gave us a great overview of the publishing world. Heidi Stemple worked with us on getting to the nuts and bolts of our stories. We had artsy session with Lisa Cinelli and Kelly Light, and writing sessions 1:1 and in small groups. We walked trails, ate well, and learned from one another. Overall, I had a great experience, and I’d do it again in a heartbeat. The time spent in the course was very well worth it and the time alone with my story was too. This past summer I received a grant to paint a bench on the Cocoa Village riverfront as part of the Art Beatz Community Art Project. Here is my step-by-step process. Try to sand the wood to a smooth surface, remove debris, and as much rust as possible before priming. Prime with an exterior primer. I used Kilz Exterior white primer. As you can see in the next step, I also used a canvas drop-cloth. It's handy for keeping the cement clean and catching drips. For this step, I used a mix of primer again with the real paint for the wood portion. I wanted to be sure the paint would adhere. For the metal parts of the bench, I lightly sanded the primer coat and painted directly onto the armrests and metal support bar underneath using Behr exterior paint. I painted a thorough coat of the background color at full strength. I added the contrasting background elements (the green tufts of grass). The green paint was not opaque so it took several coats to get full coverage over the yellow base coat. Every one of these coats of paint took at least a day to do! I suggest whatever paint you decide to use if you're doing a bench, to make sure it can withstand some rain just in case you have to pack up quickly. The summer weather in Florida varies from 90F+ heat to tropical storm... so the amount of progress on each day varied with the weather. 4) Transfer the concept onto the bench. I used black chalk because I knew it would wash off. If I had had charcoal, I would have used that instead. After sketching on the basic forms and overall placement, I added the bigger inner shapes. I do the details in paint. Despite the heat and rain, I was really charmed by my view. What a beautiful view of the Indian River! 5) After finalizing the shapes, I added details and painted multiple coats on any parts that were not looking opaque. The orange paint, for example, was not opaque. Between every coat and step, I would re-use the caution tape to warn visitors that there was wet paint. 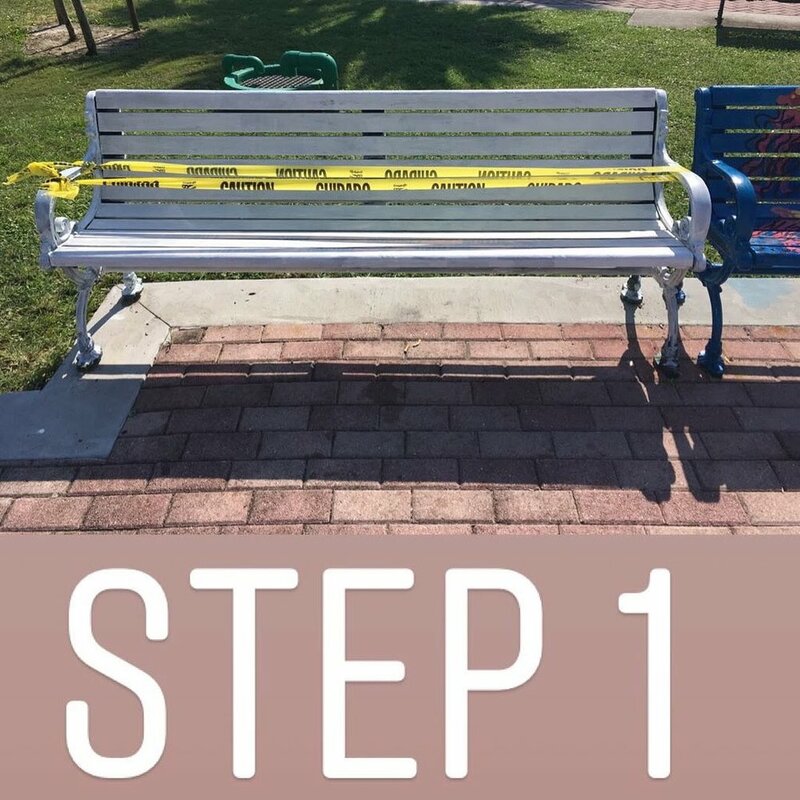 If you paint a public bench, I urge you to let people know by using cones or some kind of caution tape. Note: make sure the printed side of the tape is not touching your paint. It will transfer the black ink onto your surface. The heat is that strong! The final step is to seal the deal. Literally. Seal the bench using your most trusted clear non-yellowing spray. I used two coats of varnish (Minwax Helmsman Spar Varnish spray) and roughly 2-3 coats of the clear coat provided by the Art Beatz committee (Rustoleum Automotive Enamel in clear). The spray takes a bit to dry and it's tricky to stop people from sitting. I only taped the center of the bench so I would spray the center first, then do the sides so the center would be dry enough by the time I was ready to go. And that's it! I hope you enjoyed this tutorial and you find it helpful. If you have had great success with a different clear coat, we'd love to hear about it! If you'd like to sponsor an art bench, let the Cocoa Village Art Beatz committee know. Any business can sponsor a bench, and they're always looking for local businesses to sponsor them. Are you working on any public art projects? I'd love to hear about them! It's only summer, but already this year I have a lot to be thankful for. Back in February, I was very fortunate to win a spot with a mentor in the Writing With the Stars program organized by Tara Luebbe of Becky Tara Books site and author of Shark Nate-O and I Am Famous. The incredibly generous and fabulous mentor that decided to take me on was Brianne Farley (pronounced /BREE-ehn/ rhymes with 'Ian'). She'd never met me before, but took a chance on me and was my mentor earlier this year. Brianne's got a wry sense of humor and was the perfect match. If you're not familiar with her work, you can see her quirk-tastical illustrations in her author-illustrated books Secret Tree Fort, Ike's Incredible Ink and also in the Charlotte the Scientist series (by author Camille Andros). The Goal: create a kidlit friendly portfolio to exhibit at my regional SCBWI conference in Orlando this past June. Brianne had an excellent plan which I set about executing. This is something I know about myself - I need accountability by way of a deadline or art direction. It's hard for me to work on projects strictly for portfolio purposes. I'm very pragmatic so it feels too indulgent, so the WWTS program gave me the opportunity to have an accountability mentor.